This morning Ben and I had talked about putting the artistic gymnastics from the Commonwealth Games up on our big screen for him to share with us exactly what he had enjoyed watching over the weekend. 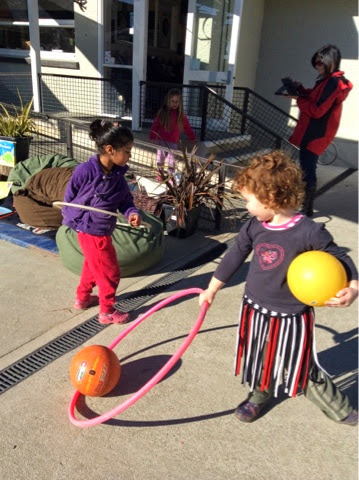 A small group of children sat and watched the gymnastics while others used our very own kindergarten ribbons to experiment with movements that they saw the professional gymnasts carry out. "can you help me get a ball and a hoop from the shed?" 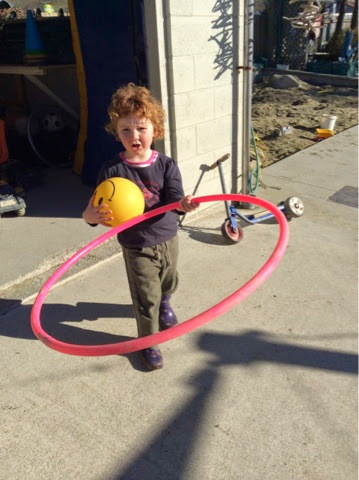 It wasn't long before Opal directed me to where we would find a ball and hoop. Tino pai rawa atu - Aboslutely aweome! 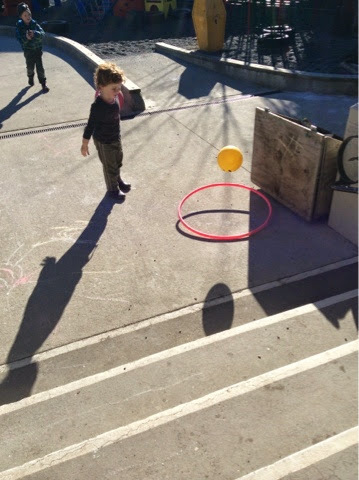 Opal began by putting the hoop on the ground and throwing the ball into the centre of it, in the beginning the ball didn't always land in the middle but it wasn't long before each time it did - practice makes perfect! 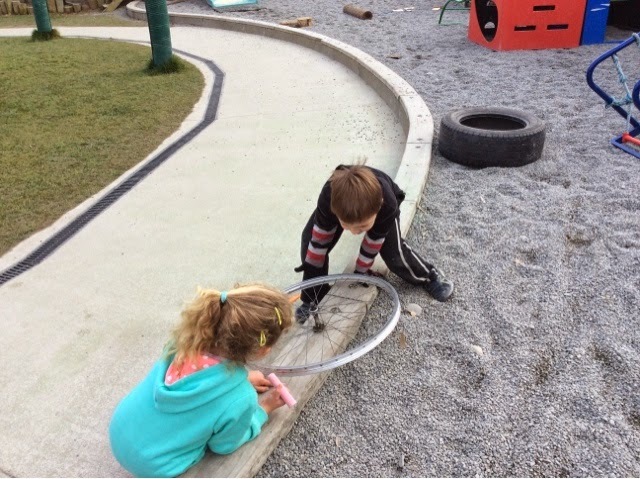 Opal played with the hoop and ball outside in creative ways, trying things out, experimenting, and persevering as she practised using each piece of equipment in different ways. It wasn't long before others showed interest in what Opal was doing and found their own equipment to join in alongsdie her. 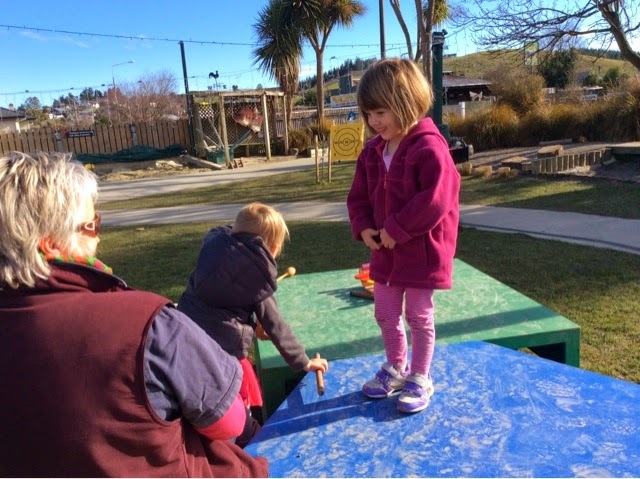 Opal took much prode in this and shared ideas and strategies with Hanna. 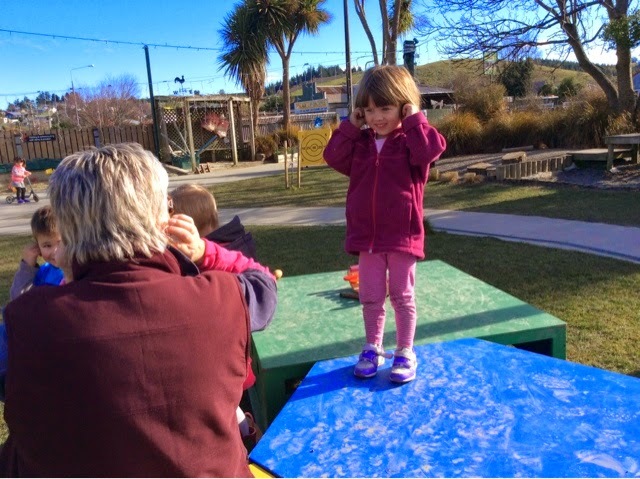 Violet remembered a song that is one of Gael's favourite and they tapped their shoulders singing "Fingers on my shoulders... cos they feel like boulders!" They laughed and carried on. "Fingers on my ears, on my ears..."
And "Fingers on my belly, on my belly..." Violet enjoyed singing the punch line of the song, "Feels like JELLY!" We loved hearing the song but especially seeing the pleasure and delight Violet was having with Gael drawing on past shared expereinces! "I see a snake and a snake sees me!" x3 "Cos I am so smart!" We sand again at the end of the day and Jessica told us that we forgot to say "Toru wha!" before beginning to sing it. What does it mean to set a record? Well, Bettina and Riley had the opportunity to learn about this at kindergarten. 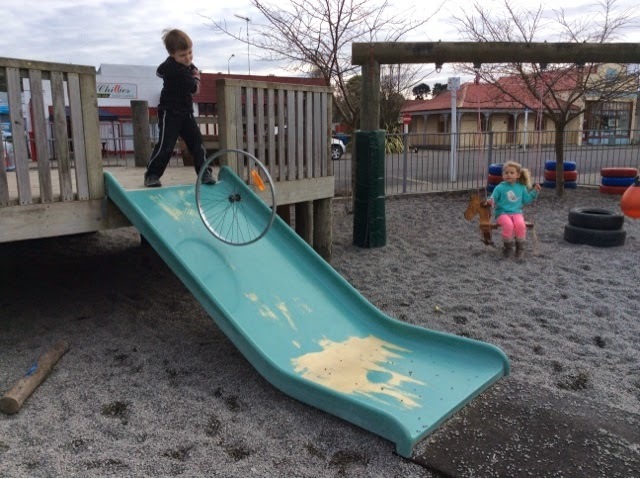 Riley was rolling a bike tyre down the slide and persisting with trying to make it go further each time. 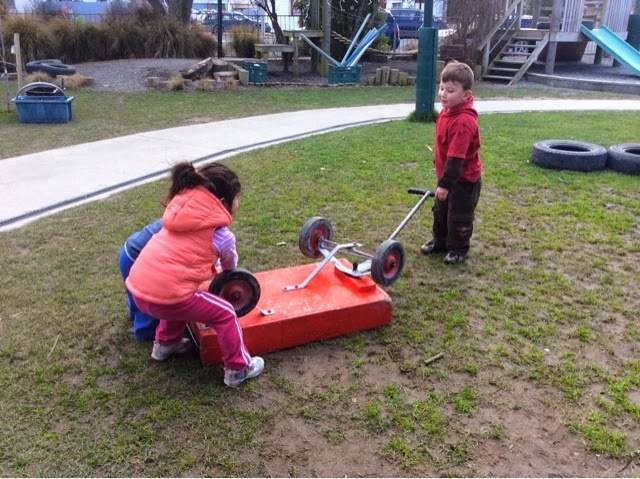 It was Bettina's job to run and check how far the wheel had gone. 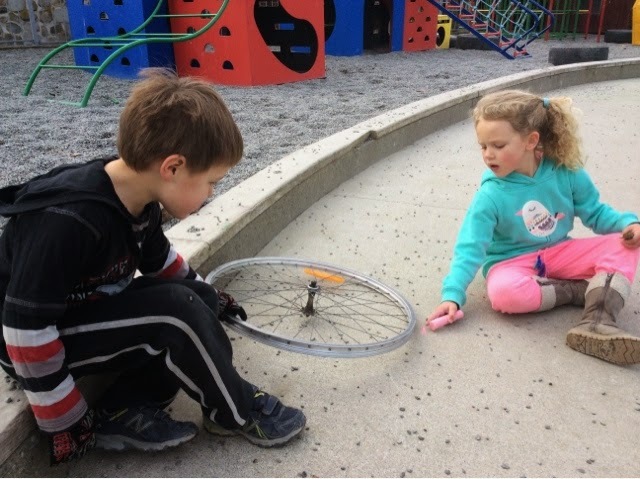 Sandra suggested she get some chalk and record on the concrete where the wheel landed each time so Riley knew if he had rolled it further or not. 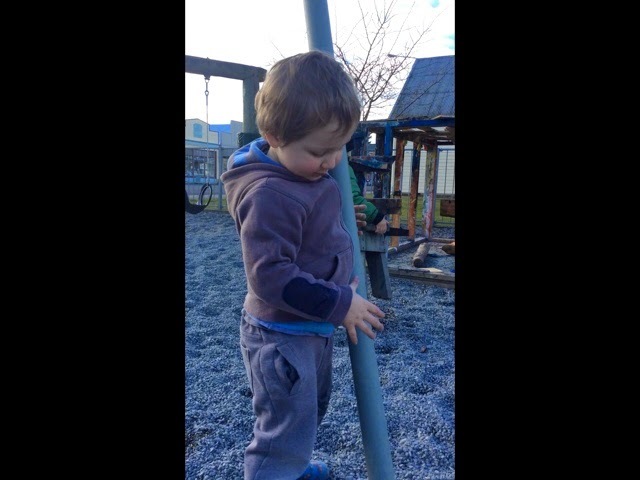 We discussed that if he got past the furtherst recorded mark, he would set a new record. Then as he persisted with rolling the wheel, Bettina would decide whether or not to record the distance. "Wow, that's a record!" she would annonunce if it went far or "Nope, that's not a record." 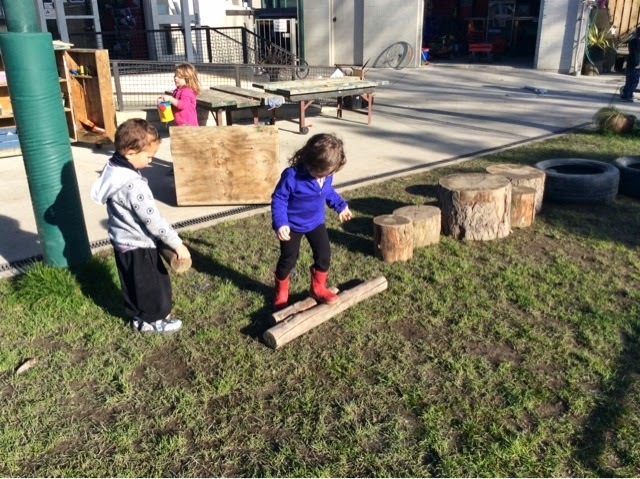 In the end their furtherst mark was the front steps and Riley was determined to get the wheel back to that point. "I'm gonna get it further," said Riley to Jackson who was watching. "See that over there?" he said pointing to the steps. "That's our record, we gotta try and beat that, right?" Bettina announced "If you beat that record you win the game, ok Riley?" Jackson and Wilbur were interested in what was happening and Bettina decided the safest place for them all to sit was behind the log. Great problem solving! Ka pai, tamariki. Lets see if you return to this game and continue to persist with setting that new record. Developing our problem solving skills. Because of the different individual problem solving skills we have noticed at the start of this week we as a teaching team have decided to follow the afternoon children's lead in problem solving and provide activities and experiences to extend this skill and Habit of Mind with our afternoon children. As a teaching team we have put some intentional teaching strategies in place to support and encourage children's problem solving skills. 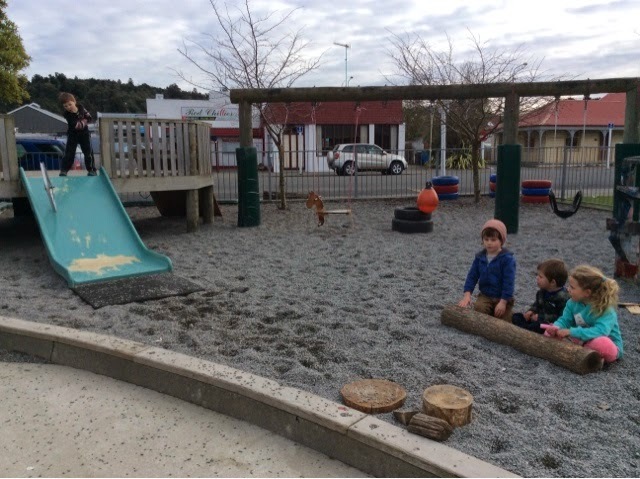 Through providing resources that are open ended like tyres, nets, pipes and ropes the children are able to follow their ideas and use this equipment to problem solve. As a team we decided to provide opportunities for the children to think flexibly by putting normal resources out in different ways, upside down and wacky, that way they have to fix or change the equipment to use it. 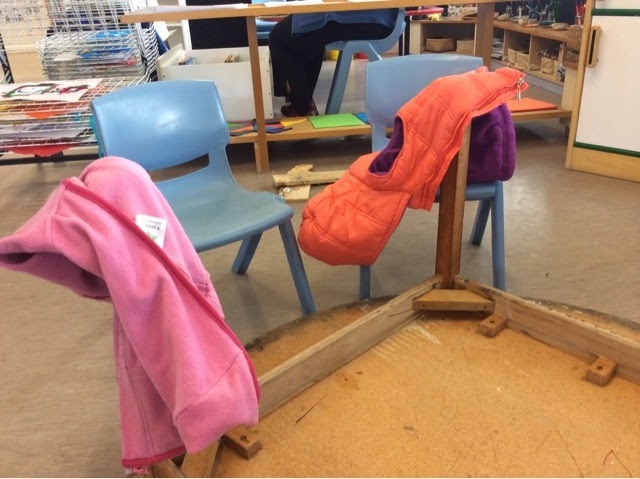 Today we did exactly that, inside we turned the playdough table upside down and then put the playdough on the chairs, we had an interesting reponse some children just carried on and played with the playdough on the chairs while they sat on the floor. Mia thought about the problem and decided that we needed to try and turn it back up the right way, so it was how it normally was, "How were we going to do this?" 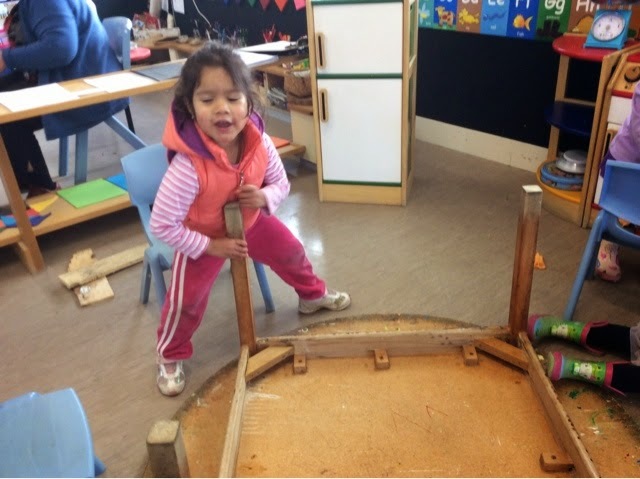 I asked so she found some friends and they tried to lift the table, "Its too heavy" Mia said so off she went to get some more friends. Again the table was too heavy to shift so instead of shifting it they found some unique ways of using the table upside down, the legs become coat hangers! He rawe tēnā, this is great! 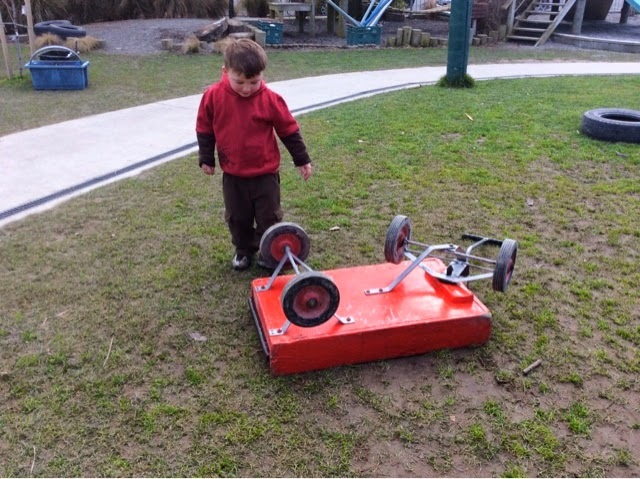 Outside the problem solving continued, when Jacob arrived at kindergarten he noticed that the trolleys were upside down, hmmm how can we use an upside down trolley? The problem solving began, he pulled the trolley like he would if it was up the correct way, oh no it didnt move. It wasnt long until some of Jacob's friends where over to problem solve with him. 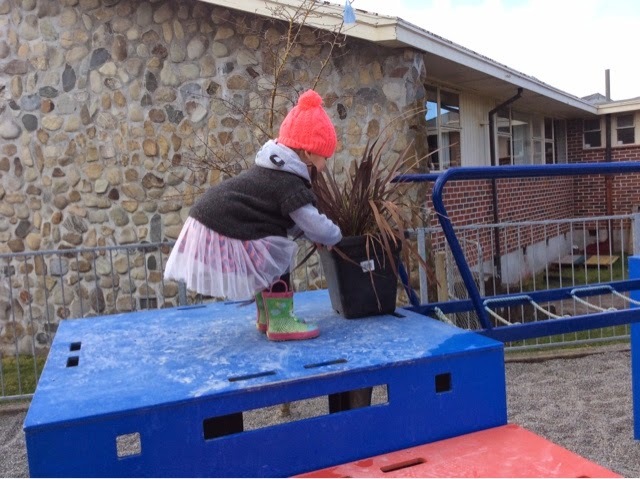 Charlotte discovered she needed to problem solve up on the climbing frame to get across our rope bridge, she pushed and pulled to move the pot plants out of the way so she could climb onto the bridge, thats good thinking, he pai koe ki te whakaaro pena. When Charlotte got to the other side she had to again solve how to move the next pot plant while carefully ballancing on the rope bridge. What an eventful afternoon the children had. Problem solving in the afternoon. This afternoon outside some of the children were individually showing lots of different problem solving skills. 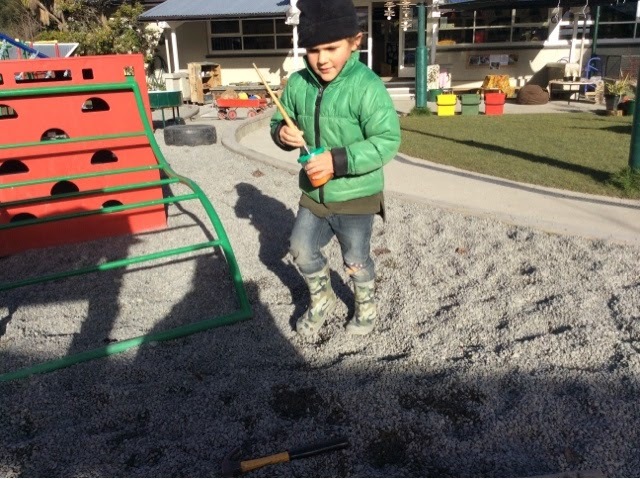 Mitchell was very busy over in our whare with lots of logs and I was intreuged to see what he was doing. 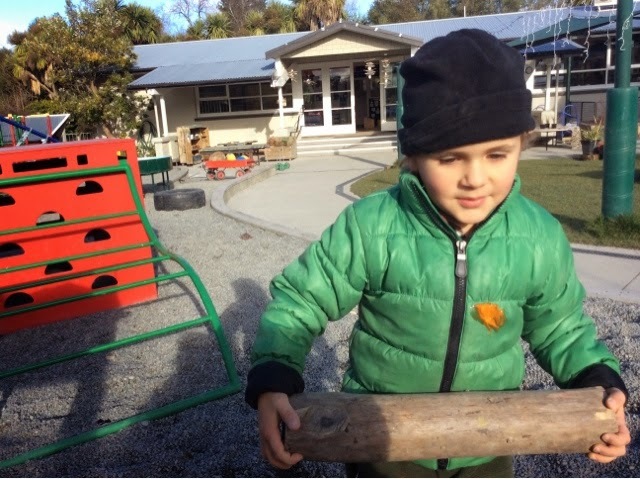 When I arrived over to the whare I asked Mitchell what he was doing he very clearly articulated "I'm building a log house" and I could see that he was hammering nails into one of our round logs,This is great he rawe tēnā! He then looked at me a little confused, I could see that he was trying to figure something out and I was interested to know what. 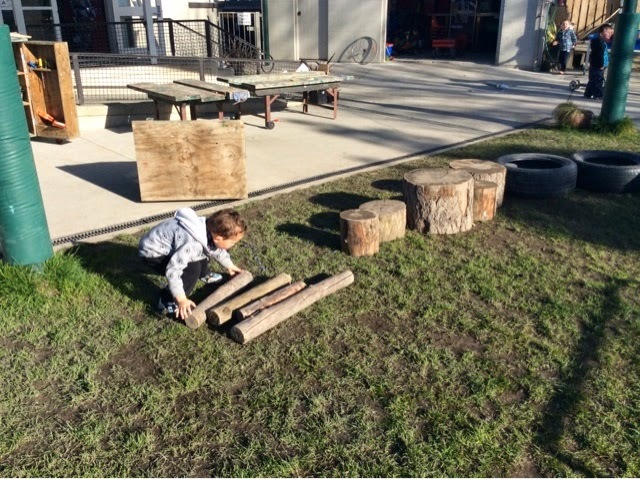 He quickly starting thinking and listing different materials he could use to attach the logs to his log house, some of his ideas "paint" "glue stick" "cello tape" "oh maybe a glue gun" were some of the things he explored. Mitchell is showing us while problem solving how much his sense of belonging has grown here at kindergarten by knowing he can go and get lots of different materials to explore his ideas! 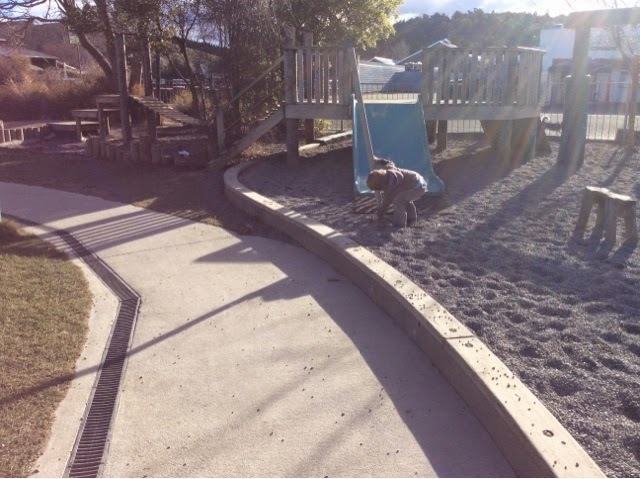 Later in the afternoon I was excited to see Nathaniel also doing some problem solving he had discovered some of our pipes over near the sandpit. He had taken the pipes over to the stones and was trying to get it to stand vertically out of the stones. Nathaniel tried stabbing the pipe firmly into the ground, he let it go and with anticipation watched to see if it would stand up, oops it fell to the ground. I could see Nathaniel really thinking about how he could get his idea to work, again he steadied the pipe and slowly let go, again the pipe fell over. 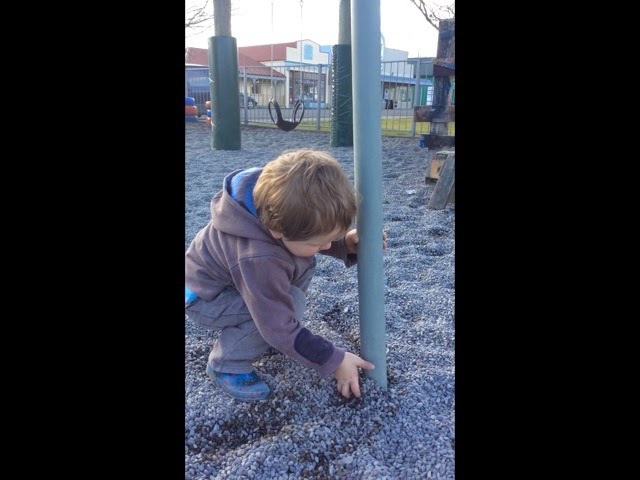 While Nathaniel was picking up the pipe he started pulling the stones towards the pipe and mounding them around the base,he pai koe ki te whakaaro Pena, that's good thinking! When Nathaniel had finished making a mound of stones around his pipe he stood up and slowly starting to let go of the pipe, this time the pipe held for a few seconds longer than his previous tries but again fell to the ground! It is fantastic to see our afternoon children showing their problem solving skills and we as teachers are very excited to see where this leads in the next few weeks. Yesterday, we decided that the weather was fine enough to go ahead with lighting the fire pit. 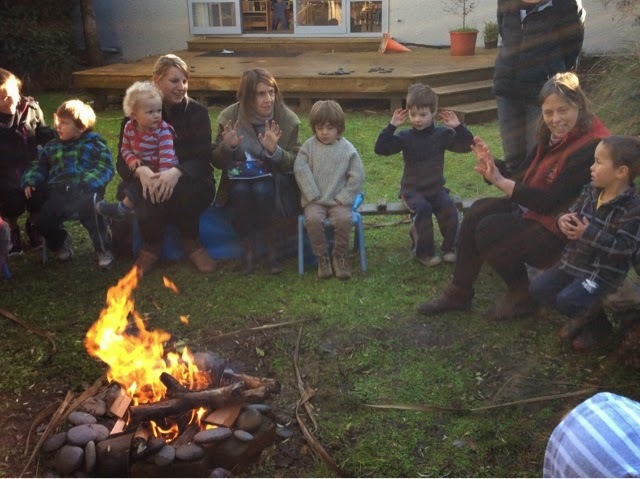 The wood was a bit damp but with Louise's expert fire skills, she soon had a good fire going! We sang songs while we waited for the fire to die down a bit, before toasting marshmallows. 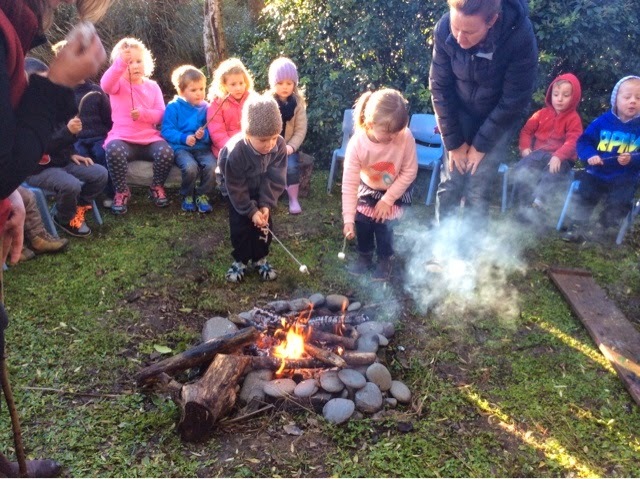 Children had to manage their impulsivity as they waited for their turn to toast a marshmallow under the watchful eye of parents and teachers. 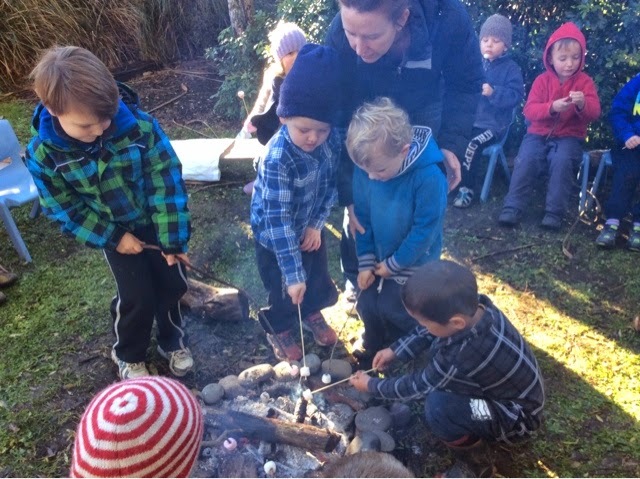 Children had the opportunity to take some responsible risks by placing logs on the fire and standing close to it with their marshmallows. Providing this type of activity allows for children to draw on past knowledge, in this case fire safety. They can devlop thoughts about consequences, a sense of what is appropriate and to manage impulsive behaviours. For Riley, Ben and Eligh this wonderful experince at kindergarten also reinforced that teachers listen to and value children's ideas. They know they can trust us to follow through with plans that are made. Thank you also to the parents that stayed and joined us for this wonderful morning. 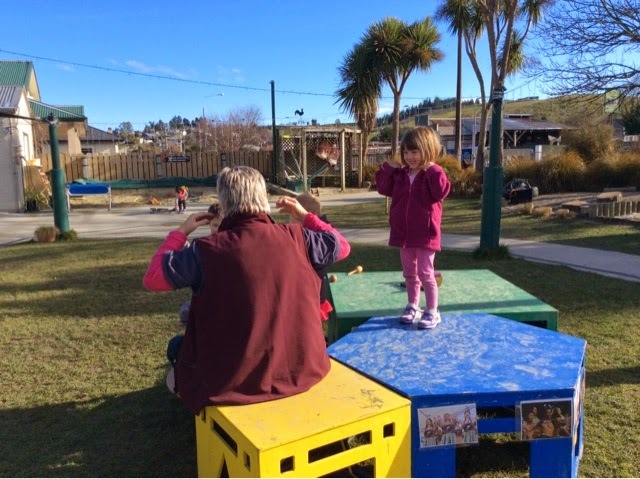 This reinforces and builds on whanaungatanga - building relationships through shared experiences and working together, which provides tamariki with a sense of belonging. This is what we treasure at Geraldine Kindergarten. 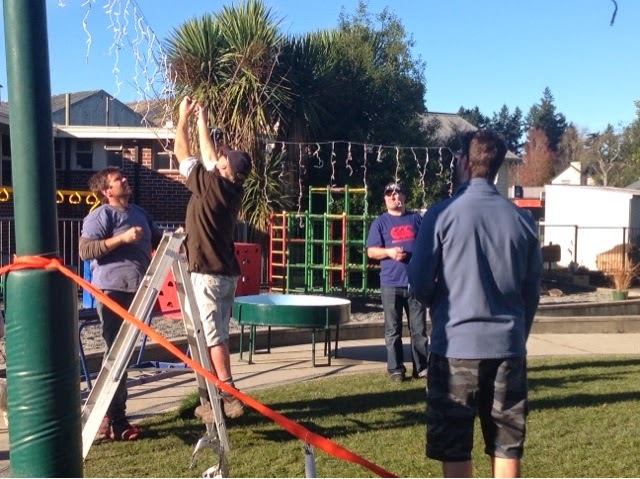 A huge thank you to our awesome helpers in the weekend preparing our Kindergarten for the Community Winter lights Festival . Jamie Adam, Daniel and Harriet Parke, Andy Buck and Lindsay Nelson you have turned our special place into a nightime "winter wonderland" He pai rawa atu, it's absolutely great! 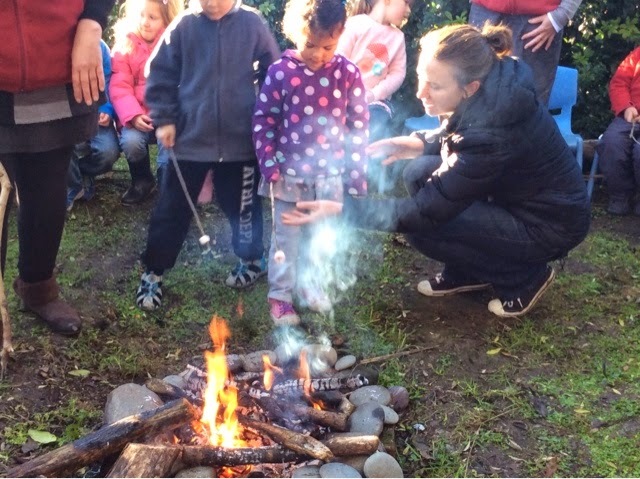 We hope to see you all at Kindergarten to start this event off next Friday 11th July at 5 pm with the Night Lights trail around our town , starting with soup at kindergarten for kai and then finishing at the Performing Arts School with hot chocolate. A weekend event not to be missed . So make your lanterns during the first week of the holidays ( glow sticks will be sold at Kindergarten on the night to pop in your lantern if you wish) Ka kite ano. See you soon! 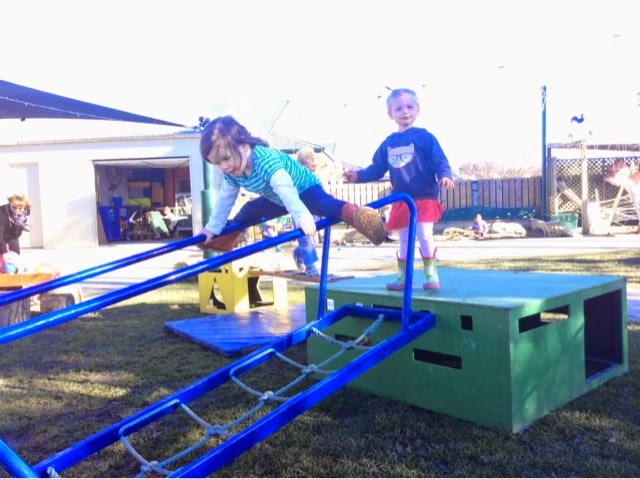 This week the afternoon children continued to explore different ways to move their bodies using the obstacle course set up on the lawn. 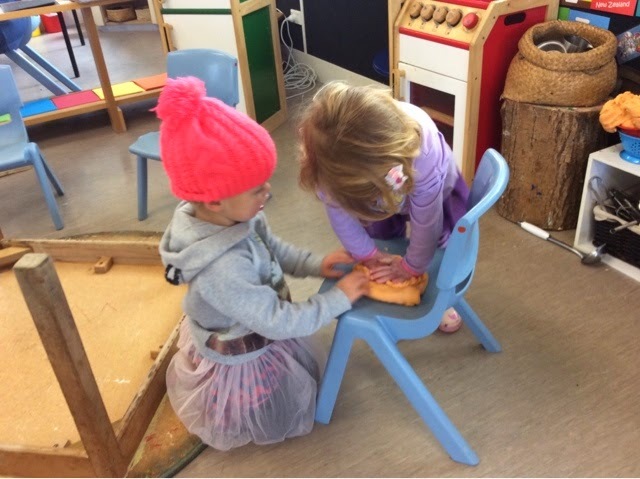 Gaining confidence in their large motor skills leads into fine motor development needed for painting, drawing and writing. 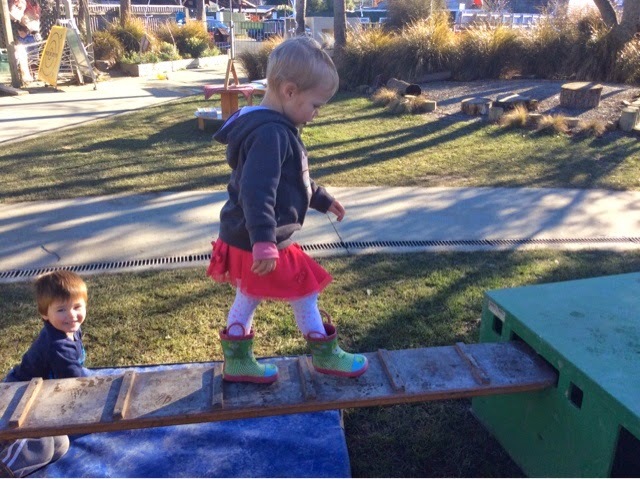 Balancing, crawling and climbing are all movements that encourage perceptual motor skills to help the brain cross the mid line, which is great development for reading later on.